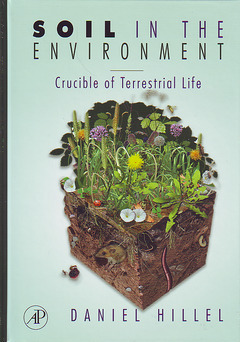 Key for every course in soil science, earth science, and environmental disciplines, this textbook engages students to critically look at soil as the central link in the function and creation of the terrestrial environment. For the first time, Dr. Hillel brilliantly discusses soils as a natural body that is engaged in dynamic interaction with the atmosphere above and the strata below that influences the planet's climate and hydrological cycle, and serves as the primary habitat for a versatile community of living organisms. Soil in the Environment offers a larger perspective of soil’s impact on the environment by organizing chapters among three main processes: Physical, Chemical and Biology. It provides students of geology, physical science, and environmental studies with fundamental information and tools for meeting the natural resource challenges of the 21st Century, while providing students of soil science and ecology with the understanding of physical and biological interactions necessary for sustainability.